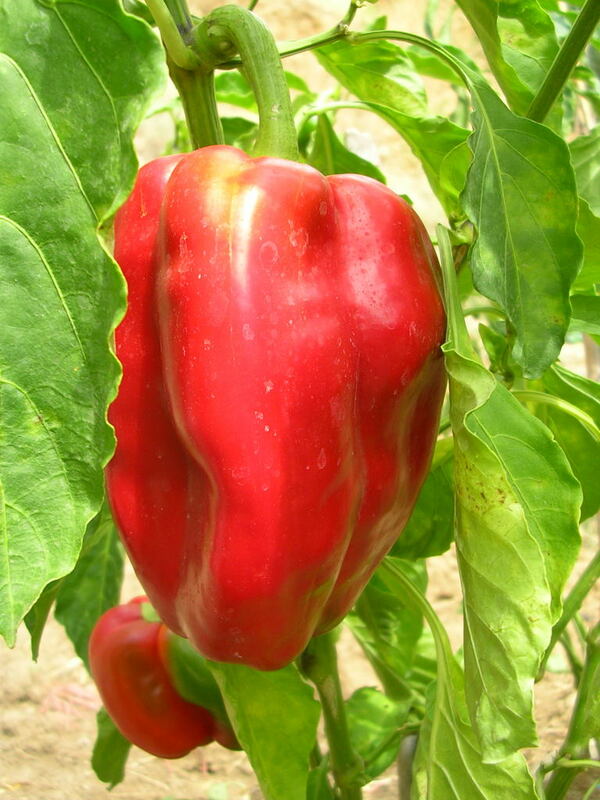 Peppers are coming fast and furious. 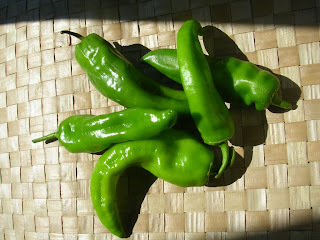 Last week I was frying the thin green ones (read about frying peppers here). 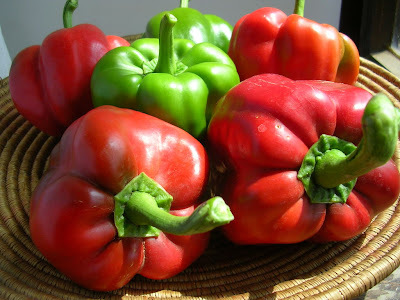 This week I’m stuffing big fat red bell peppers that are rampant in the garden. Bell peppers ripen in the garden. 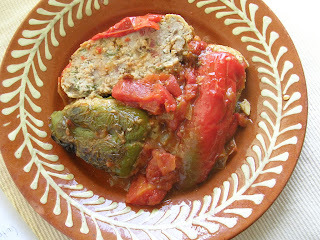 I used to love my Missouri grandmother’s stuffed peppers. She used ground beef and rice and braised the peppers very slowly in the oven. But in southern Spain, I’m still not ready to turn on the oven. So I prepare the peppers Spanish style, cooked on top of the stove. But I make some adjustments here too. 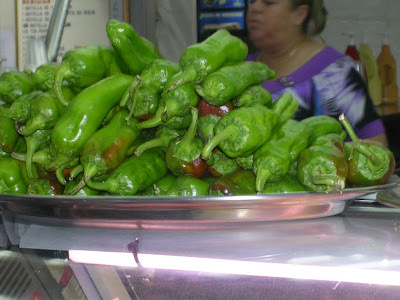 Spanish cooks almost always roast the peppers first, peel them, then stuff them. But without their skins, the peppers don’t sit up smart in the pan. So I skip that step. End-of-season tomatoes are perfect for making a chunky sauce to cook with the peppers, but canned tomatoes can be substituted. I like ground pork for the stuffing, but you could use ground beef or chicken thighs instead. 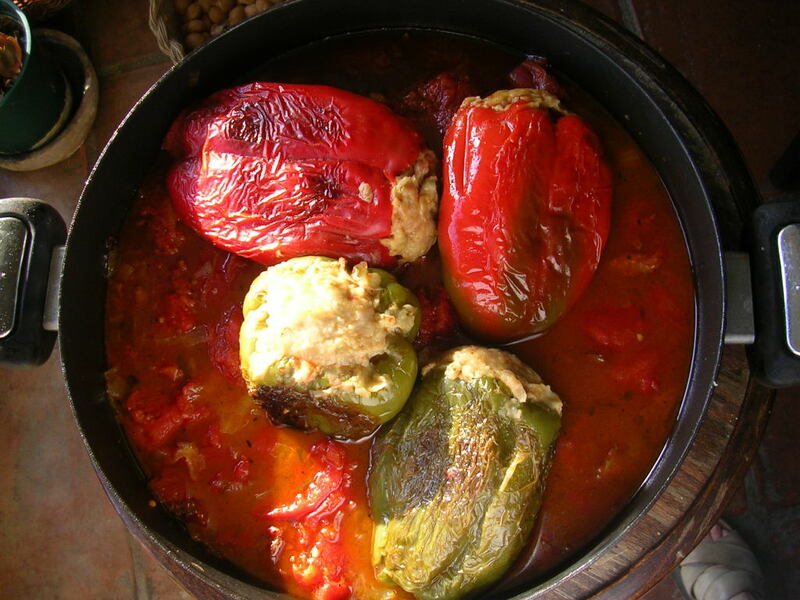 Another sort of stuffed pepper is the piquillo. You will find more about piquillo peppers and a recipe here. 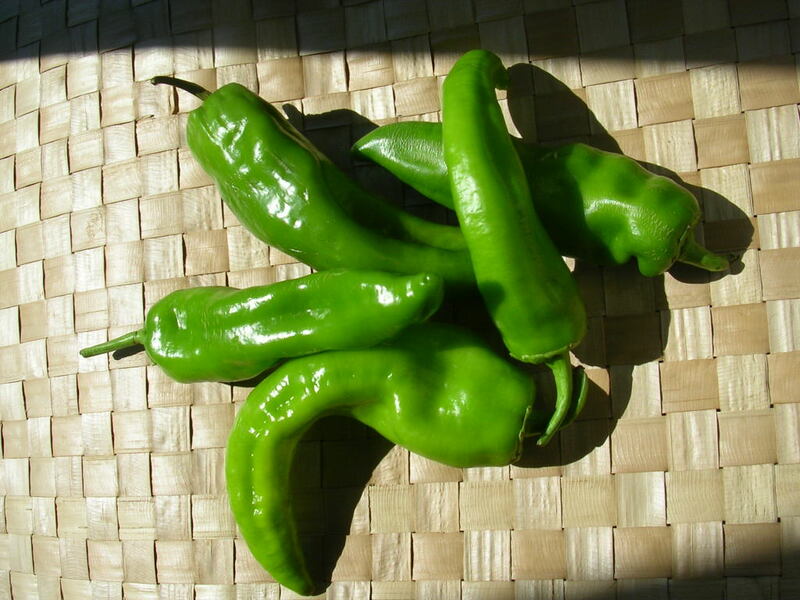 Remove stems and seeds from peppers. Bring a large pan of water to a boil and blanch tomatoes until the skins split, about 1 minute. Drain and let them cool, then peel the tomatoes. Cut them into wedges or small chunks. Soak the bread until softened in milk or water. Squeeze out the liquid and discard. Crumble the bread into a mixing bowl. Remove 1 tablespoon of beaten egg and reserve it in a saucer. Add the remaining egg to the bread. Add the minced onion and minced garlic. Stir in 1 teaspoon of salt, nutmeg, cloves, pepper, and parsley. Add the ground meat and chopped ham. 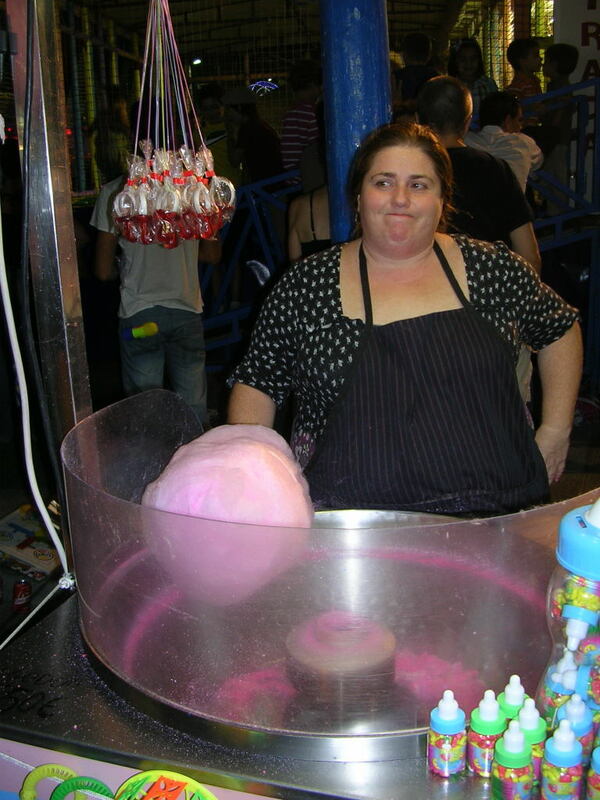 Combine the mixture well. Stuff the peppers with the meat mixture. Dip the open ends of the peppers in the reserved beaten egg, then into the flour. Heat the oil in a deep skillet. Fry the peppers, floured-side down. Add the chopped onion and garlic and turn the peppers to let them fry slowly on all sides, about 8 minutes. Add the tomatoes, cumin, 1 teaspoon salt, and pepper. 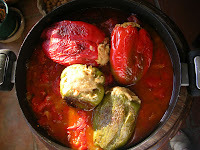 Bring to a boil, cover the skillet, and simmer 45 minutes, turning the peppers occasionally. Remove the lid and cook another 20 minutes, until pepper skins are shriveled and tomato sauce is reduced. 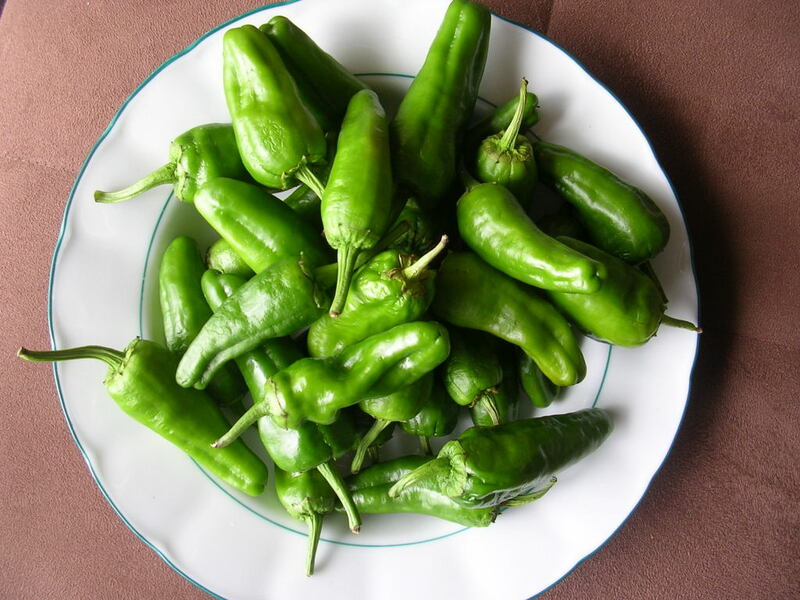 Cut the peppers in half lengthwise and arrange on a serving platter. Spoon the sauce over them. Peppers stuffed with pork with chunky tomato sauce. A village feria is a party on a grand scale, usually accompanied by fun-fair rides, sports competitions, cultural exhibitions, feasting. And round-the-clock partying. In my village, the feria happens early in September, in honor of the Virgen de la Peña, the Virgin of the Rock, so-called because the image was discovered in a stone grotto on the edge of town. Baby girls are named in honor of the patron, so lots of girls in town are called Peña--Rock. If I had had a girl child, I might have named her "Rock". 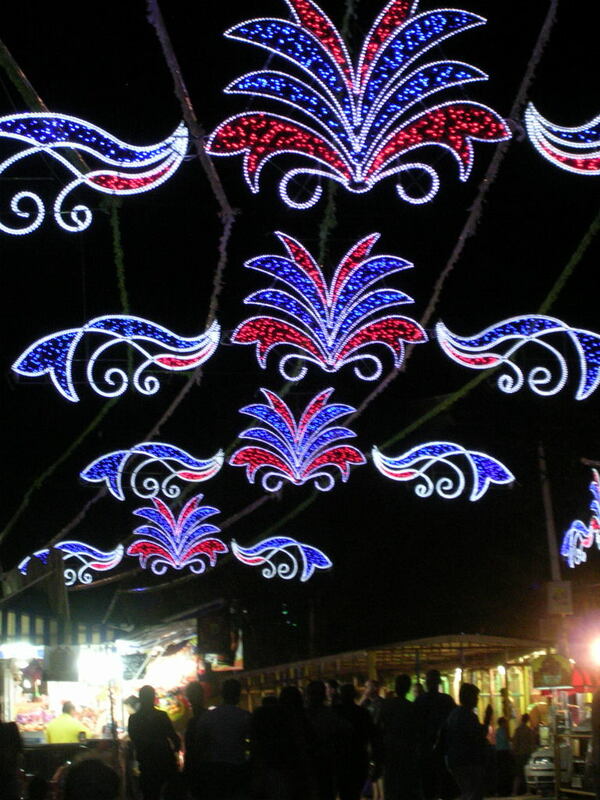 When the village was poor, people saved all year to be able to splurge on special treats during feria--a night out with bottles of fino Sherry, grilled shrimp and roast chickens; bars of sweet almond nougat; dancing till dawn; flamenco shows; rides for the kids. Now, people have more money, but they still do it all, buying chucherías, sweet treats, for the peques, small children, and grown-up treats for themselves. 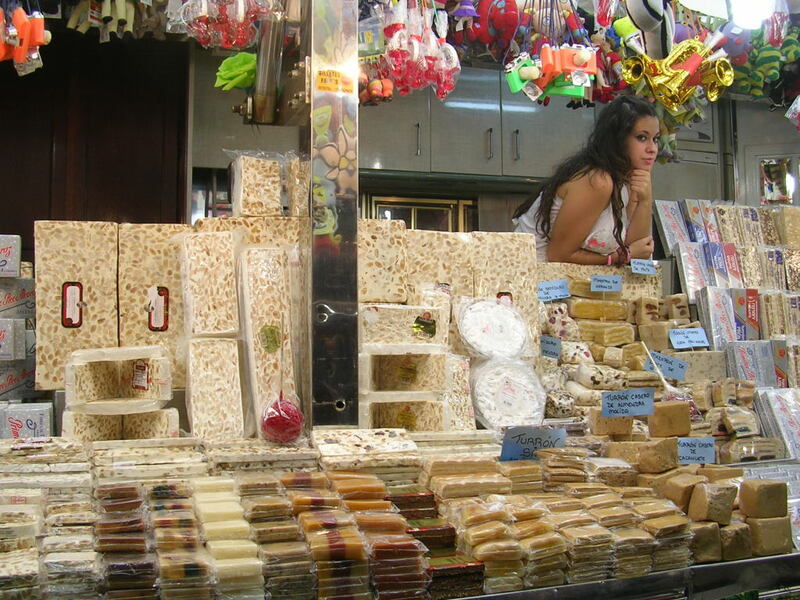 Almond nougat--turrón--and a pretty girl. 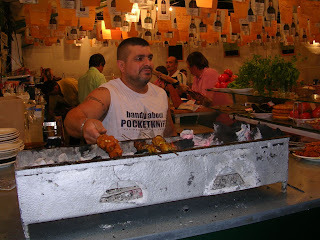 Pinchitos are mini-kebabs of spicy pork. 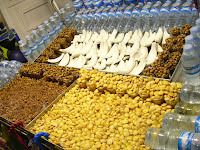 At another stall, potato chips are made fresh, fried in deep vats of oil. This year, the Greens Party has a bar selling brochettes of organic vegetables! At the end of a long night of partying, it’s traditional to finish with a “breakfast” of churros y chocolate, deep-fried crullers served with thick hot chocolate. 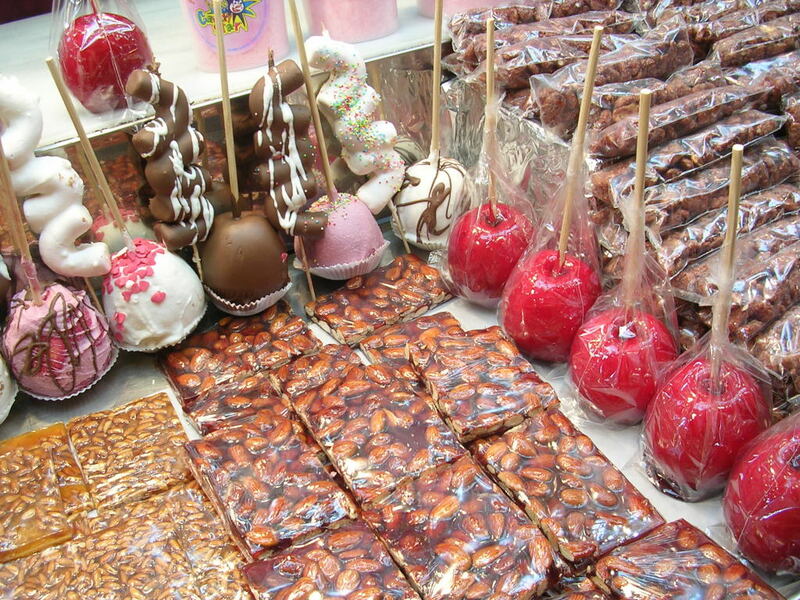 Almond brittle and candied apples. 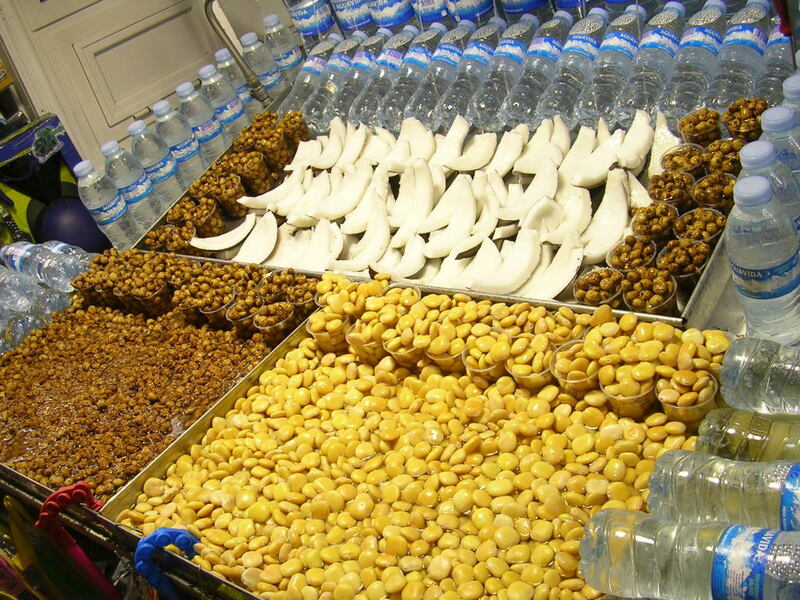 Filled almonds--but the label says peanuts. Potato salad with lemony dressing. Invited to a friend’s barbecue supper, I offered to bring a side dish. How about potato salad? 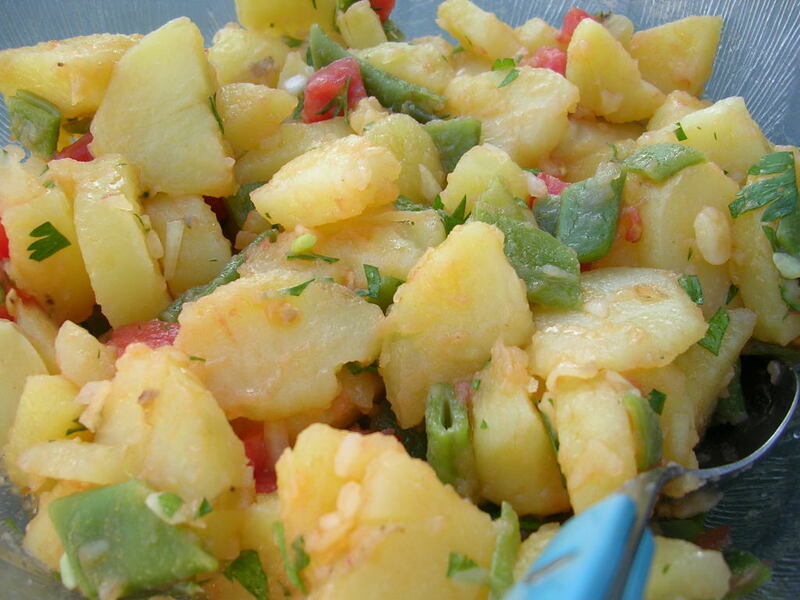 I make a Spanish-style potato salad, ensaladilla de patatas, also known as papas aliñadas. Unlike most American-style potato salads, it has no mayonnaise, but a lemony olive oil dressing. But, how was I to know that José also was bringing potato salad? His was another version, this one with mayonnaise, called ensaladilla rusa or “Russian” salad. It was shaping up to be a mano a mano of potato salads! I watched as guests tried one or the other, sometimes both. Gotta admit, the mayo salad is more seductive. But everyone who tried my version raved about it. 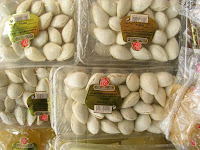 Both versions of potato salad are popular in tapa bars in Spain. In fact, I would bet that ensaladilla rusa is the most requested tapa of all times. It’s a real guy favorite. I asked José (José Antonio Ruiz is manager/creative director of Caravelle Design ) for his recipe. He said it was his mother’s recipe and the secret was to use homemade mayonnaise, not mayonnaise from a jar, made with either a mild-flavored olive oil or with sunflower oil. If you read Spanish, see his notes. My recipe follows. Unlike Jose´s version, it does not include shrimp and tuna. Para la ensaladilla, aparte de las patatas, el huevo picado y la zanahoria, usar guisantes, pepinillo en vinagre picado muy pequeño, pimiento morrón en bastante cantidad, no sólo para adornar, aceitunas rellenas, alcaparras, langostinos cocidos y pelados. NUNCA USAR MAIZ. (no corn kernels). 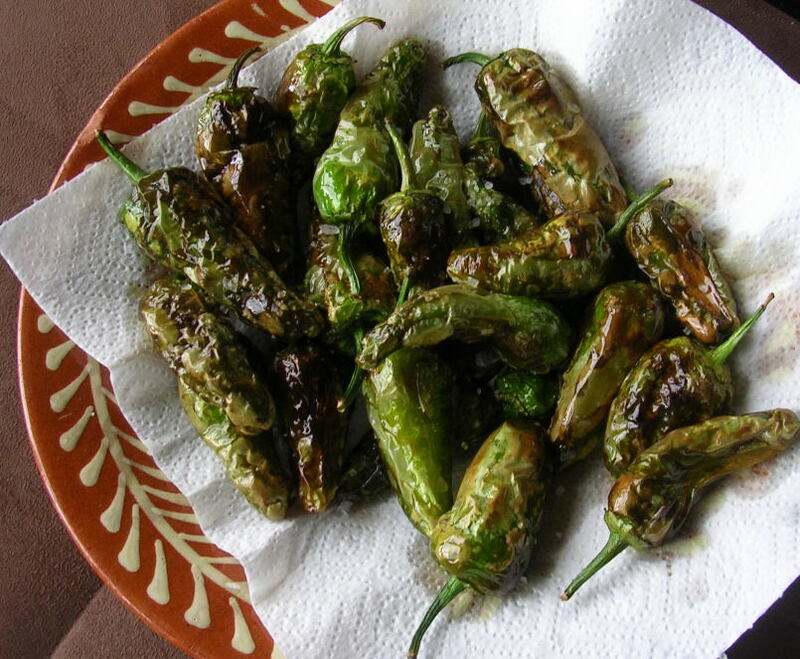 En vez de atún, usa bonito del norte y la mayonesa es casera, no de bote, con aceite de oliva muy suave o con aceite de girasol. También es importante el punto de sal en las patatas antes de mezclarlo todo y dejar que repose todo por lo menos 12 horas antes de comer. 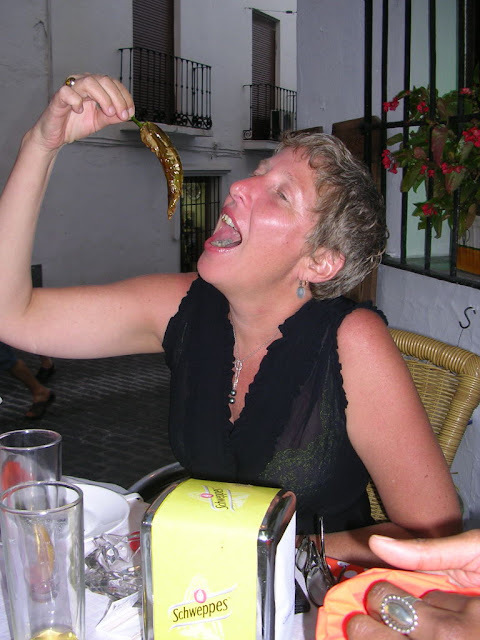 Makes 8 tapas or 4 to 5 side servings. Cook the potatoes and carrots in boiling water to cover until tender. The carrots will take about 12 minutes; the potatoes a total of 20 minutes. Cook the peas until tender, about 10 minutes. Drain vegetables and chill them. Peel the potatoes and cut them in ½-inch dice. Cut the carrots lengthwise in quarters, then slice crosswise into small dice. Combine the potatoes, carrots and peas in a bowl. Add the salt, oil, chopped piquillo peppers, egg and onion. In a small bowl combine the pickle, mustard, parsley, mayonnaise and vinegar. Whisk until smooth. Stir into the potatoes. 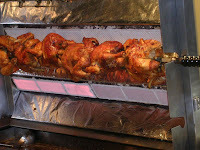 Let the potatoes stand 2 hours at room temperature or, covered and refrigerated, up to 24 hours. Serve cold or room temperature. Garnish the top with capers. Potato salad with green beans. Spanish potato salads are usually made with mealy baking potatoes that soak up lots of the tasty dressing. Take care not to overcook the potatoes, or they will disintegrate. Tip: Potatoes will slice without crumbling if you chill them before peeling and slicing. This salad often has chunks of canned tuna added to it. If you use a good brand of tuna in olive oil you can use the oil from the can to flavor the potatoes. 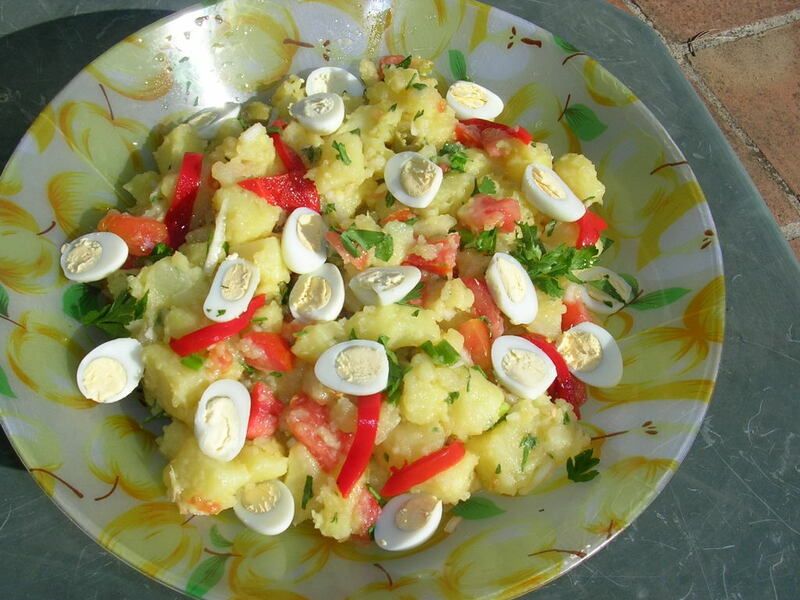 The potato salad pictured at the top has sliced quails' eggs. The one to the right has sliced green beans added to the potatoes. 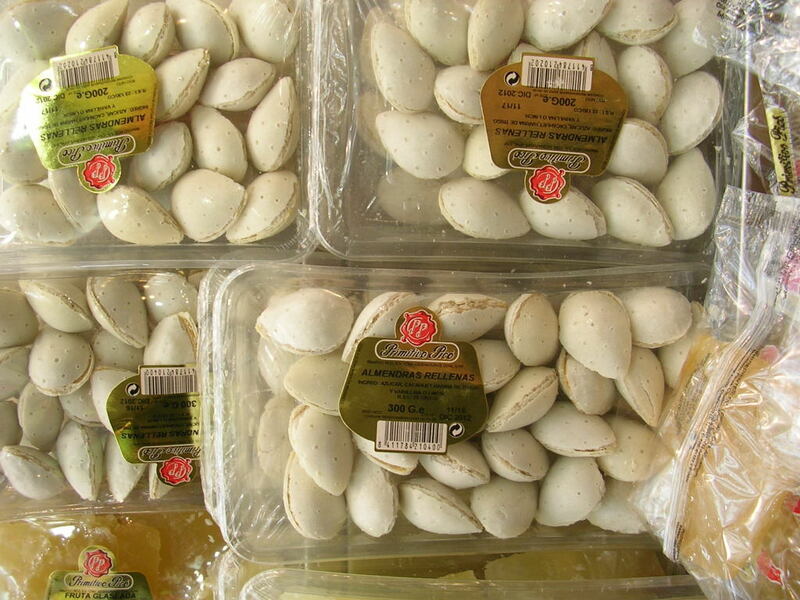 Serves 10 to 12 as a tapa or 6 as a side dish. Cook the potatoes in their skins in boiling water until just tender, 20 minutes. Drain. When cool, peel and slice the potatoes. In a large bowl, combine the salt, onions, tomatoes, oil, lemon juice and parsley. Add the potatoes and combine gently so the potatoes are evenly covered with the dressing. Allow the salad to marinate for at least 2 hours at room temperature, or, covered and refrigerated, up to 24 hours. Spread the potatoes on a platter. Garnish them with sliced egg, chunks of tuna, strips of pimiento and olives.